Beijing authorities have decided to close schools and to stop outdoor construction after the Chinese capital issued its first “red alert” over smog levels. The red alert is the highest possible, and has not been used in Beijing before, the state-run Xinhua news agency says. Chinese authorities expect more than three consecutive days of severe smog. Cars with odd and even number plates will be banned from driving on alternate days. The alert comes as China, the world’s largest polluter, takes part in talks on carbon emissions in Paris. Current pollution levels in Beijing are actually lower than last week’s, but the red alert has been placed because of levels expected over the coming days. The order will last from 07:00 local time on December 8 until 12:00 on December 10, when a cold front is expected to arrive and clear the smog. China’s CCTV news channel reported at the weekend that some parts of Beijing had visibility of only 660ft. Coal-powered industries and heating systems, as well as vehicle emissions and dust from construction sites, all contribute to the smog which has been exacerbated by humidity and a lack of wind. At 18:00 local time on December 7, the air pollution monitor operated by the US Embassy in Beijing reported that the intensity of the poisonous, tiny particles of PM 2.5 was 10 times above the recommended limit. 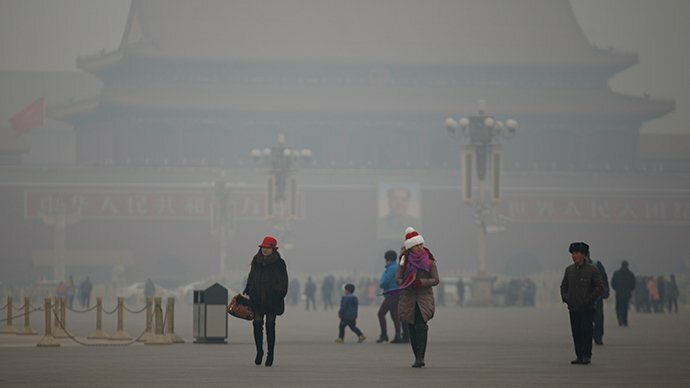 The level in Beijing reached more than 256 micrograms per cubic meter in some of the worst-affected areas. The World Health Organization considers 25 micrograms per cubic meter to be a safe level. Activists said the level hit 1,400 micrograms per cubic meter in the north-east city of Shenyang last month, saying it was the worst seen in China. Last week, activists from Greenpeace had urged the Chinese government to declare a red alert. Another Chinese city, Nanjing, issued a red alert in December 2013. On November 30, Beijing issued an orange alert – the second-highest of the four-tier system adopted in 2013. Correspondents say Chinese officials had been unwilling to commit to hard targets on reducing carbon emissions, but have now realized that the dependence on fossil fuels has to stop. Chinese President Xi Jinping vowed to take action on the emissions at the current global climate change talks in Paris.